We know how it feels coming home to an accidents caused by your little family member - your loving pet. They did not mean to do it - it just happened. Sunny & Honey Professional Stain and odor Eliminator battles even the toughest jobs caused pets! How does it work? Our Professional Stain & Odor Eliminator has a Natural Bio-Enzymatic formula which eliminates the stain and odor at the root. Once the product is sprayed at the problem area, the Enzymes are activated to clean up the organic stain/odor problem. This product is scented with a fresh like scent - leaving the affected area perfectly clean and smelling fresh. What will it clean up? 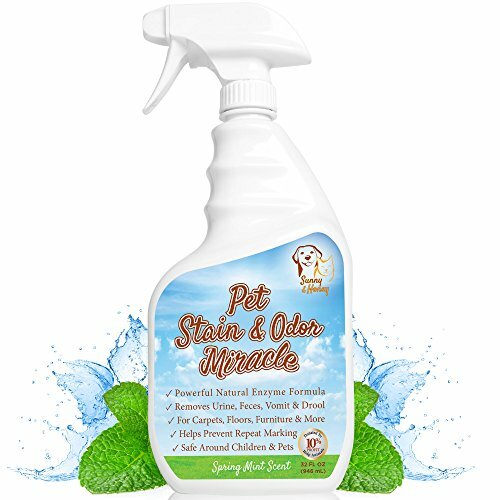 Any organic stain and odor caused by your pet. This includes: Urine, Feces, Vomit, Drool, etc. What surface will it clean? Carpets, Rugs, Hardwood, Tile, Cloth & Leather Furniture, Animal Bedding, Pet Crates & Cages, Litter Boxes, Pet Travel Bags, Automobiles, RV's, and many more! Is it Safe? No harmful chemicals here! Our product is safe around children and pets. Is it certified? Our Professional Stain & Odor Eliminator is certified by The Carpet and Rug Institute. The CRI seal of approval assures our customers that this product is effective and it will not damage your carpet or furniture. Our products are manufactured in U.S.A. Is there a Guarantee?Absolutely! We offer a 60-Day Money Back Guarantee. If you are not satisfied for any reason with our product - just send it back. You have everything to gain and only a pet made mess to lose! Click - ADD TO CART - Right Now! View More In Litter & Housebreaking. If you have any questions about this product by Sunny & Honey, contact us by completing and submitting the form below. If you are looking for a specif part number, please include it with your message.